If witness preparation, speaking training, and more powerful body language are what you’re looking for, you’ve come to the right place! We know what it takes to help you and your colleagues communicate better and work more smoothly together. We also offer executive coaching, conflict resolution, team building, organizational consulting, and speeches on many communication topics. Our goal is nothing less than to make you and your professional workplace achieve high productivity and excellent communication. We serve executives, independent professionals, and teams in business, health care, higher education, associations, and the legal profession. We’d like to come to know you and your organization. 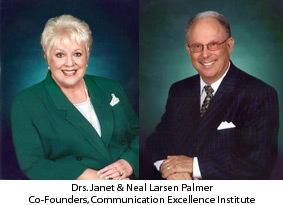 FREE... Want to get some free thought-provoking articles on communication for professionals and executives? 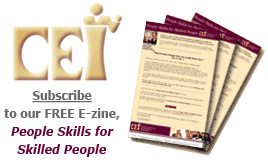 Click here to view our ezine, People Skills for Skilled People. If you'd like to subscribe to PSSP, click here. 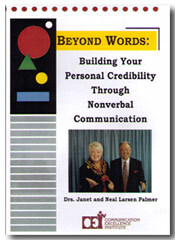 and check out our exciting new DVD on how to maximize your credibility in interviews, presentations, and in every interpersonal encounter.